Debut fantasy features an intriguing, well-drawn mythology. 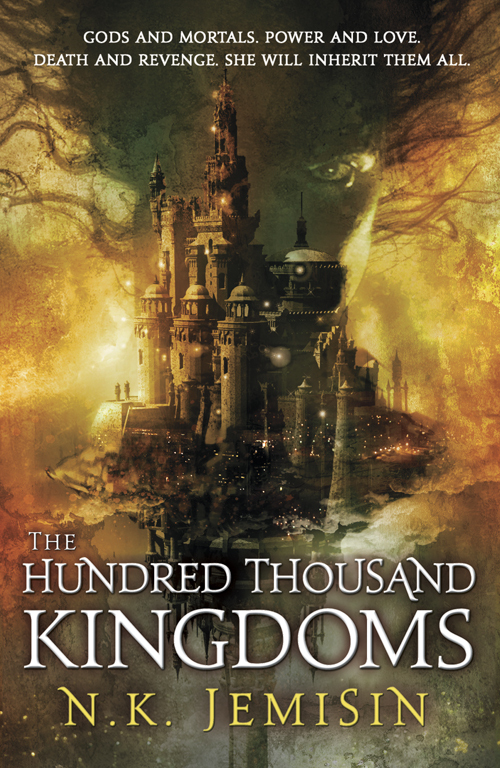 At first glance, the basic plot may seem standard: A young woman, narrator/protagonist Yeine Darr, is named heir to the Hundred Thousand Kingdoms, which plunges her into a power struggle with two rival cousins. But Jemisin’s world-building and attention to detail raise this story to another level. In the novel’s complex but well-defined universe, a war between the gods took place in the distant past. The losing divinities were punished severely and forced to become the slaves of mortal humans. Yeine’s life becomes increasingly entangled with these subjugated gods as she navigates royal politics and tries to uncover the truth about her family history. Jemisin lavishes considerable care on her fictional universe, but she also creates a subtle, emotionally complex character in the thoughtful Yeine. Readers will definitely look forward to future installments of the projected Inheritance Trilogy. An offbeat, engaging tale by a talented and original newcomer. Top Pick! This is an astounding debut novel. The worldbuilding is solid, the characterization superb, the plot complicated yet clear. Yeine is a fantastic protagonist, and her journey toward her destiny is compelling and memorable. The secondary characters are equally well done, and all the details of the world come together for a cohesive and diverse whole. Look no further for an original and thought-provoking novel. Starred Review!When her mother dies mysteriously, outcast barbarian Yeine Darr answers a summons to the grand city of Sky from her grandfather, King Dekarta Arameri. Proclaimed one of three heirs to the throne of the Hundred Thousand Kingdoms, Yeine must learn the customs of the skyborne capital and its ruling elite before she succumbs to their treachery. Debut author Jemisin creates a mesmerizingly exotic world where fallen gods serve as slaves to the ruling class and murder and ambition go hand in hand. VERDICT: An engaging heroine and a fresh take on traditional dynastic fantasy make this trilogy opener a delight for the fantasy reader and introduce a strong new voice to the genre. Starred Review! Convoluted without being dense, Jemisin’s engaging debut grabs readers right from the start. Yeine desires nothing more than a normal life in her “barbarian” homeland of Darr. But her mother was of the powerful Arameri family, and when Yeine is summoned to the capital city of Sky a month after her mother’s murder, she cannot refuse. Dakarta, her grandfather and the Arameri patriarch, pits her against her two cousins as a potential heir to the throne. In an increasingly deep Zelaznyesque series of political maneuverings, Yeine, nearly powerless but fiercely determined, finds potential allies among her relatives and the gods who are forced to live in Sky as servants after losing an ancient war. Multifaceted characters struggle with their individual burdens and desires, creating a complex, edge-of-your-seat story with plenty of funny, scary, and bittersweet twists. Other reviews, which I’m tracking via Delicious.